Kelly is not a big fan of vegetables, but sauteed broccolini is one of her favorites (mainly because it doesn’t taste like broccoli). The trick is to season with a little bit of red pepper flakes, finish with lemon, and – most importantly – don’t overcook! Prepping the broccolini is about as easy as it gets — lop off the ends. Broccolini and red pepper goodness. Quick de-glaze with white wine (those small bottles of the cheap stuff come in handy for this type of recipe) and the broccolini will steam in the wine. Once it’s all bubbly, cover so the broccolini will steam. Finish with some lemon juice. Heat the olive oil and red pepper in a large skillet over medium high heat. Add the broccolini and garlic, and saute for several minutes, stirring with tongs occasionally. Add the white wine, cover, and cook for several more minutes. 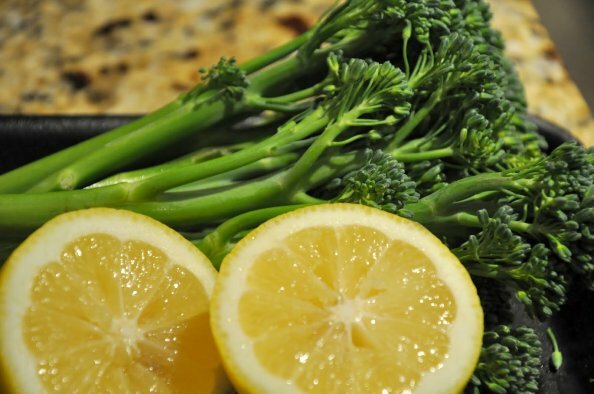 Remove the lid, stir the broccolini, and add the lemon juice. Cook for another few minutes until the broccolini is done. Add salt and pepper to taste, and serve immediately. Looks great! I’ve never cooked broccolini but will definitely try this one. The kids love broccoli but I’m thinking with the red peppers and the wine, this one is for an at-home date night dinner with just the grown ups.